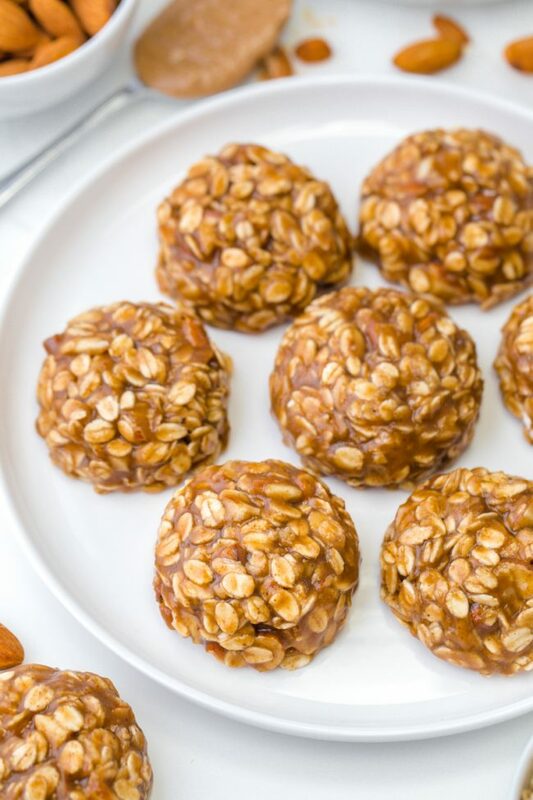 These soft and chewy no-bake almond butter cookies only take a few minutes to put together and are full of delicious fall flavors! Naturally vegan, gluten-free, dairy-free and 100% whole grain. Things have been slow around here lately. We just started our first family vacation and there was a ton to prepare beforehand. 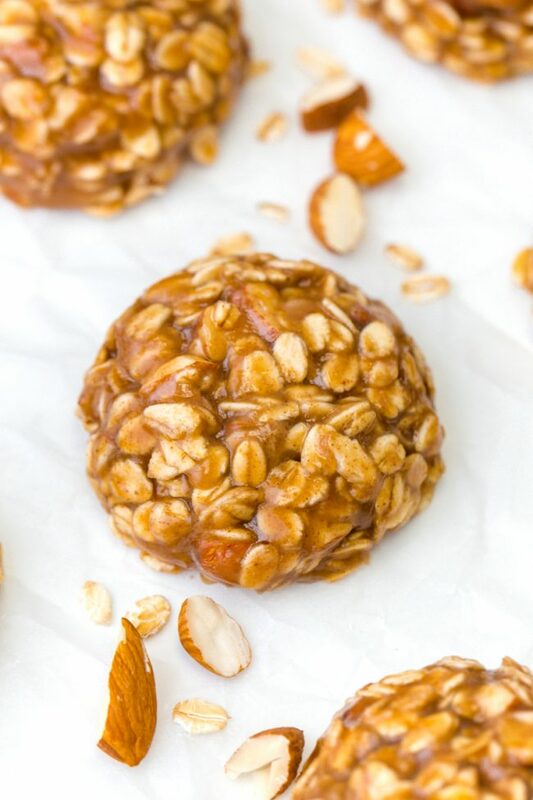 If I hadn’t underestimated how long it’d take to get everything together, I would have made a batch of these no-bake almond butter cookies to take along! Instead I just made these paleo pumpkin muffins and these paleo apple muffins. Both of which got smashed into a dense block of delicious goo. These almond butter cookies scream fall. If you want a more dominant maple flavor, use Grade B maple syrup or a little maple extract. What was surprising for me while making this recipe is just how important salt is. I used homemade unsalted almond butter (here’s how to make homemade almond butter) and after mixing the liquid together, it didn’t taste all that exciting. Just kind of like… eh, whatever. Adding 3/16 teaspoon of salt made a world of difference! If that sounds like a ridiculous measurement, you need this set of measuring cups and spoons. You can omit the almonds if you want and use whatever you’d like in their place. Or nothing at all! Cinnamon chips are delicious (but I know… not at all healthy). I think chocolate chips are kind of strange in these cookie but maybe white chocolate would be a better fit? Definitely be sure to toast the almonds! It makes a world of difference. And as a bonus, they’re dietary-friendly! One thing these almond butter cookies are not is cheap. Mr. T tasted one and asked if I could make another batch to bring to a friend. I promptly told him that wasn’t going to happen. Add the almond butter, maple syrup, cinnamon and salt and stir until well combined. Turn the heat up to medium and while stirring constantly, bring the mixture to a boil. Boil for 2 minutes, stirring constantly. The mixture should thicken a little. Don't boil it longer than 2 minutes or it may separate. Remove from the heat and stir in the vanilla and oats until well combined. If using almonds, stir them in now. Use a medium cookie scoop to scoop out balls of the mixture onto a piece of parchment paper. Refrigerate in an airtight container for about a week. I used refined coconut oil which doesn't have any coconut taste. If you use unrefined coconut oil, these may have some coconut taste to them. To roast almonds, place on a baking sheet and bake for 5-8 minutes at 350 °F (175 °C) until they smell toasty. 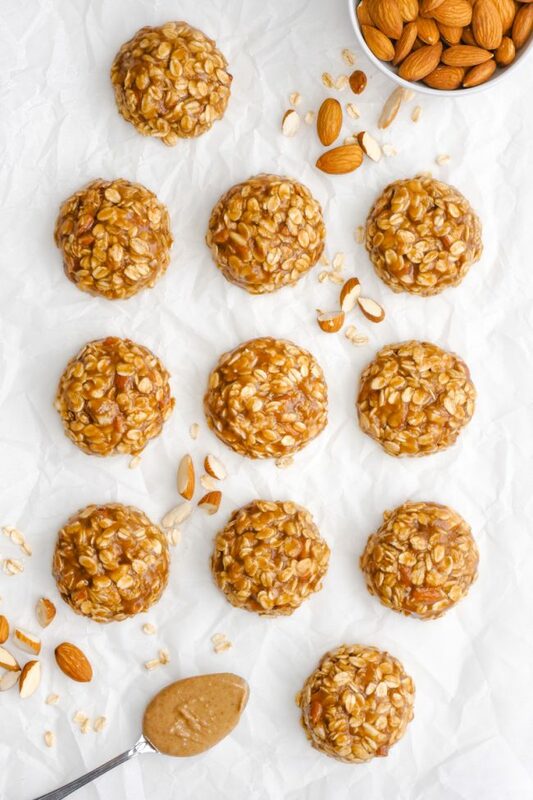 60 comments on “No-bake Almond Butter Cookies (vegan, gluten-free, whole grain, dairy-free)” — Add one! these look perfect for that mid afternoon snacking thing I have going on… ;) saving! Beautiful and delicious cookie AND no bake?!!? Can’t go wrong here! 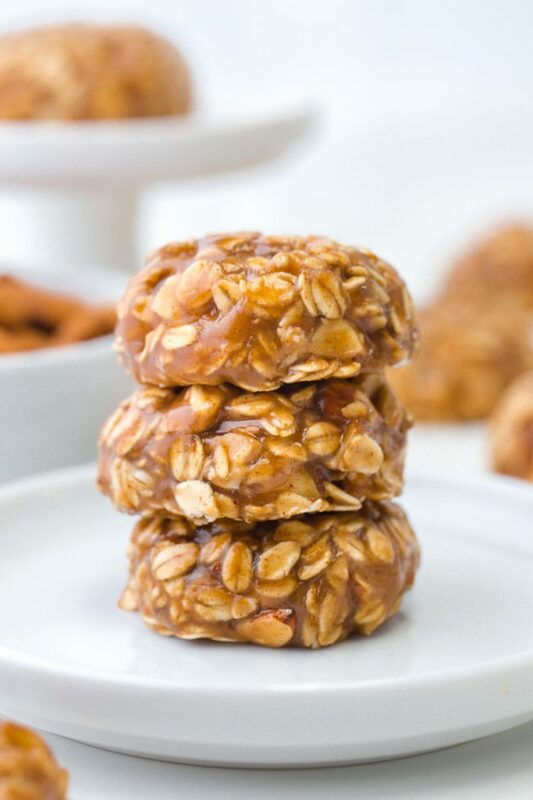 I’ve got no bake cookies on my agenda to make this week and these look perfect! I love how you’ve made them so wholesome. I am a big fan of the recipes you create. I made these cookies exactly as the recipe reads. Perfection. I decided to make them again, added the ½ teaspoon of almond extract as one reader suggested. Again perfection. I went a little further, made my own almond butter, added the ½ teaspoon of almond extract, used butter instead of coconut oil and added goji berries. Once again, perfection. Hi Diane! Sorry for just now seeing you comment. I’m happy to hear that you’re a big fan of the recipes. :) These cookies must be extra delicious with almond extract! I still have to try that. And goji berries sounds like an interesting addition! I just bought some but have never tried them. Thanks for the tip and for your nice comment! What an I use in place of cinnamon ? Have a friend who’s allergic . You can omit it or add some cardamom! I was wondering what I can use in place of coconut oil. I know it’s healthy but not tolerated by my GI system. Would olive oil work?? I think the cookies wouldn’t be firm if you used any liquid sweetener. Butter should be fine, though. :) Maybe ghee, too. Yes. I have used olive, canola, sesame and avocado. You need to use less or add 1/8 cup of ground flax seed (corn or tapioca flour might be okay or a banana?). 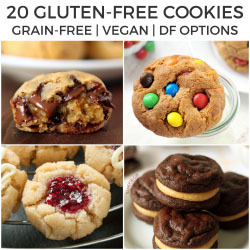 Would anyone have a good guess as to calories per cookie? Thanks for the tip! I’m really surprised that those oils work in this recipe. And good to know about the added flax! I don’t know the calories but you could use this recipe analyzer for the nutritional profile. :) Thanks again for your comment! Nope. They’d probably just melt and be a mess. Just found this recipe and they are delicious. Thank you for sharing. I followed the recipe but also thought maybe adding almond extract as 1/2 the vanilla measurement and may try that next time. Now in my favorites. I’m sorry for just now seeing your comment! 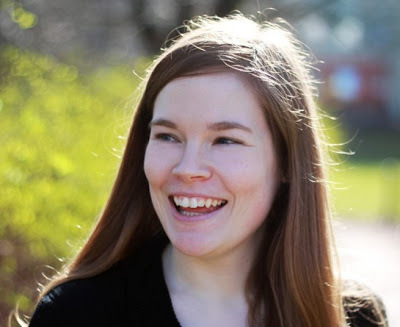 I don’t know how I missed it and for so long (yikes – sorry again!) I’m happy to hear that you and the others enjoyed the cookies. :) Thanks for your comment! These taste great! I did tweek the recipe just a little. Instead of vanilla; I added almond extract and added a little more cinnamon. I will definitely make again! So happy you liked them! Your tweaks sound great. Thanks for your comment! These cookies look perfect! Can’t wait to try them! Can you tell me how many calories and carbs etc are in a cookie? I didn’t see a nutritional chart added. Sorry I just now saw your question! I don’t have that info but you can copy and paste the recipe here for the nutritional profile, if you’d like. :) Hope you’ll enjoy the cookies! These look like a great snack for kids – or for myself, really! These look completely delicious and so dangerous, especially given the fact that they’re no-bake!! Thanks so much for coming back to let me know how it went! I’m thrilled that you enjoyed them and were able to restrict yourself to just one. I’m jealous of your willpower. ;) I hope you’ll enjoy my other vegan treats. I don’t have that many but I’m trying to do more. Thanks again! I seriously can not make these. I’m afraid that I will just eat them all day! They look so tasty! Pinning (because I’m going to obvs have to make them)! It is pretty easy! They even have it at Lidl and Aldi during their dumb “American weeks.” Only 2.79 euros for a 250 ml bottle. Pretty good deal, right?! Oh anything pumpkin is my jam right now! But almond butter and maple will always have a place in my heart! And I started to laugh when you went over how they aren’t cheap…I get the same way with treats like this…that stuff is like gold! These sound wonderful and I adore making sweet goods with coconut oil, it has such a great “melt in your mouth” quality! I have to admit I skipped right over posting anything about apples and went right into pumpkin! This weekend we’ll be picking apples though and I know I will be in need of creating some awesome apple recipes with the bunches we acquire from 3 kids picking! Love no bake cookies! Oh, you naughty girl! ;) I wish I could go apple picking with you! It’s always so fun. Sorry to be a pain, can you answer these? Can I you suggest alternates to vanilla and cinnamon? can I use cashew butter? or in fact any nut butter? You’re not a pain! You can simply omit the vanilla and cinnamon. You could also use a different type of spice if you like. I haven’t tried it but I’m pretty sure other nut butters would work. I’ve done a peanut butter version which was amazing! Could you tell us the nutritional info per cookie? I don’t have that info but you can copy and paste the recipe here for it, if you like. :) I have to admit that they’re quite addictive! If you have an issue with eating them all up, like I did, they freeze well. Good luck on the weight loss and thanks for your comment! Am going to make these tomorrow, will report back! These cookies would not be safe around me! They look scrumptious! I will never tire of nut butters and maple syrup, so keep the recipes coming! These cookies look perfectly gooey and tasty – I’m certain that I wouldn’t be able to stop at just one.